I decided to use my favorite gray at the moment, Franciscan gray Maison Blanche chalk paint. It’s actually the same color we painted our downstairs bathroom cabinet with here in our Michigan house. I am obsessed with this paint & it’s one of the best chalk paints… actually I take that back, probably the best chalk paint I have ever used. I didn’t do any prep to the chair besides a quick clean up with a paper towel & some windex. After the chair was clean I did two quick coats of paint. The paint dries super fast so I did this all while watching an episode of Real Housewives of Beverly Hills while wondering if those ladies have ever painted a piece of furniture in their lives & put it in one of their million dollar mansions.. wouldn’t that be cool. Well, if you are reading housewives, send me a photo of your furniture makeover so I can share it here on the blog! These are the things that go through my head while painting. After two layers of paint dried I sanded the piece to give it a distressed look & then waxed it with my Maison Blanche clear wax which is also a favorite of mine. 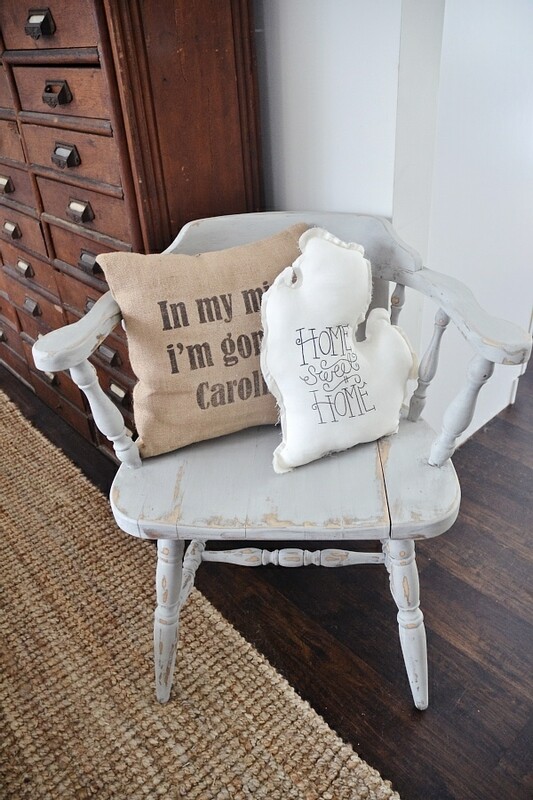 Seriously this gray is the perfect neutral & soft this gray paint is & I love how it looks on this adorable little chair. I wish I had room for it in our Michigan house, but alas for now we don’t so the chair ended up at my booth here in Michigan at Painted Farmgirl if you are looking for a cute gray accent chair, desk chair, a chair for basically any room in your home. 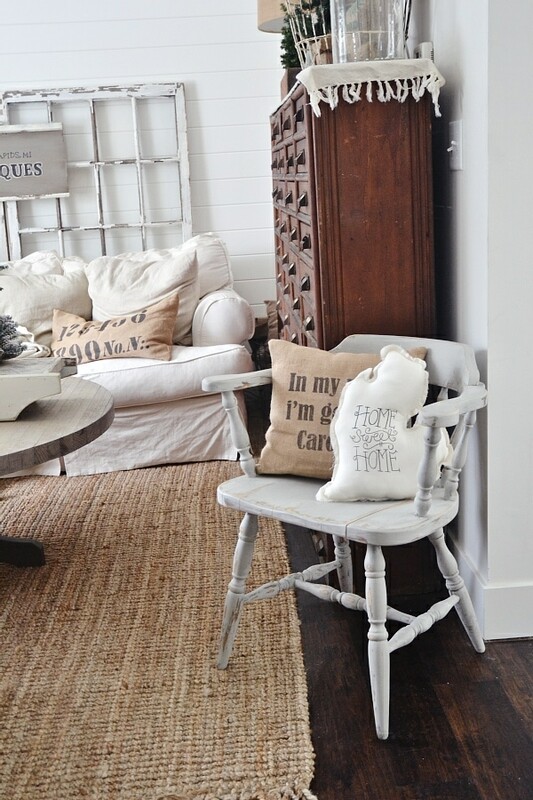 I’ll be super jealous if you go & pick up this little gray chair & send me a photo of it… like really jealous. Ok, let me know what you think of the chair in the comments below & let me know what you think of the color too. I’m thinking about doing a dresser with this color to, what do you think? Let me know in the comments below, find me on Facebook, & chat with me on Instagram. « New Year… New Booth! How many of those chairs have I thrown away? On a different note, what is the saying on the pillow that starts “In my mind”? Super cute! 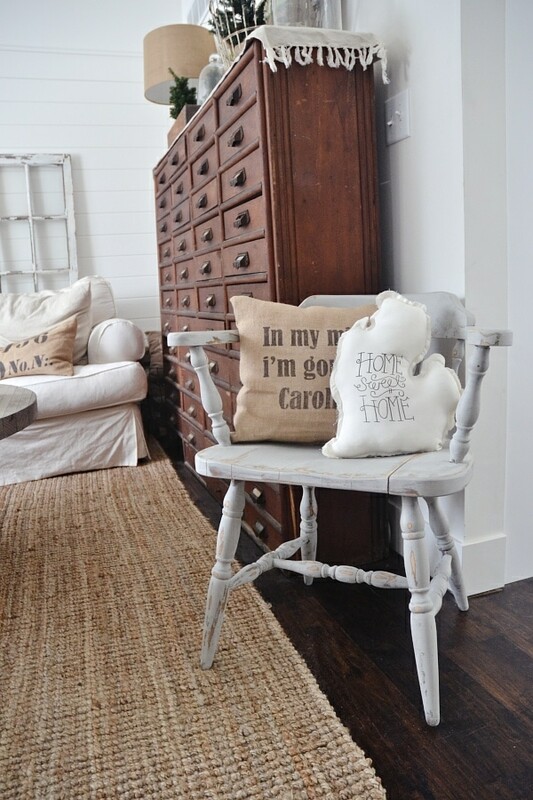 I have some chalk paint I’ve been thinking of trying on a church pew I recently picked up at a tag sale. Glad to hear it is so easy to use! This chair is beautiful! The pale grey is the perfect color for it. Where did you get the Michigan pillow? Love it and need one to send to my daughter. Love the chair. I had one exactly like yours…..my husband decided to give it to Goodwill without my knowing he had given it away….until tonight. I’m so not a happy camper. Love the look of this makeover – that chair is unrecognizable! 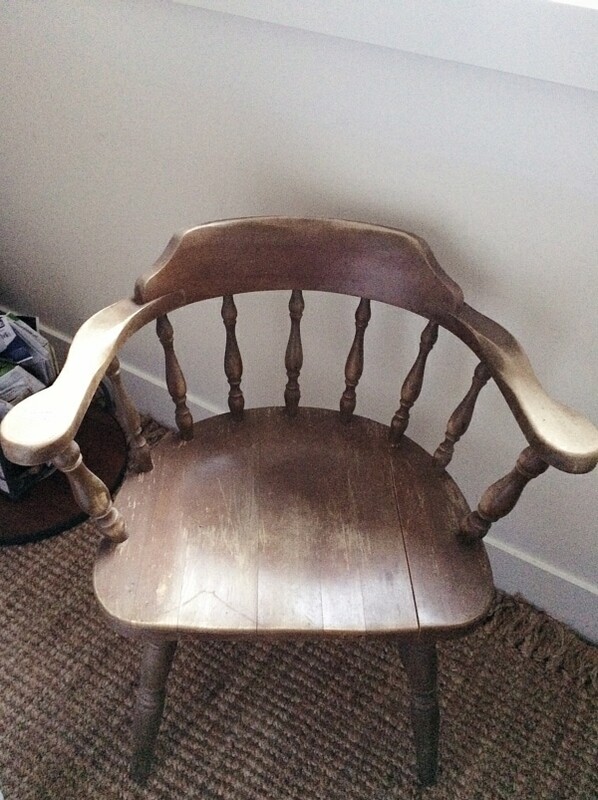 I have a similar chair that needs a face-lift – I may just send it to you 😉 Fingers crossed the RHOBH send you their DIY projects – ha! I have 4 chairs just like that in the storage room in my basement. I’ve never known what to do with them, maybe I’ll work on one of them. Your makeover of your chair is incredible. You took what was once a cold, dark, hard looking chair and transformed into an inviting soft grey place to sit complete with pillows and throw. I love it! 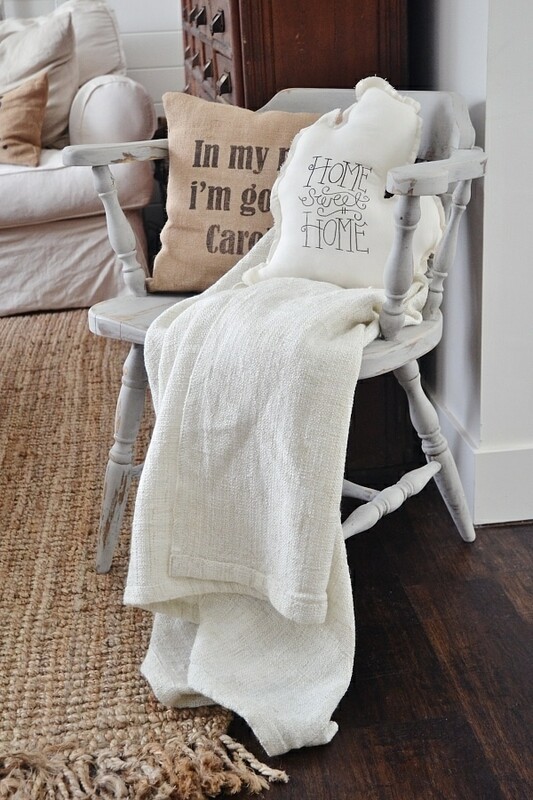 I love the chair and the color, but I’m more in love with the burlap pillow–does it say “In my mind, I’m going to North Carolina” or something similar? I would looooove to purchase it! Is that possible? I’m in California. Hi Liz, super cute! 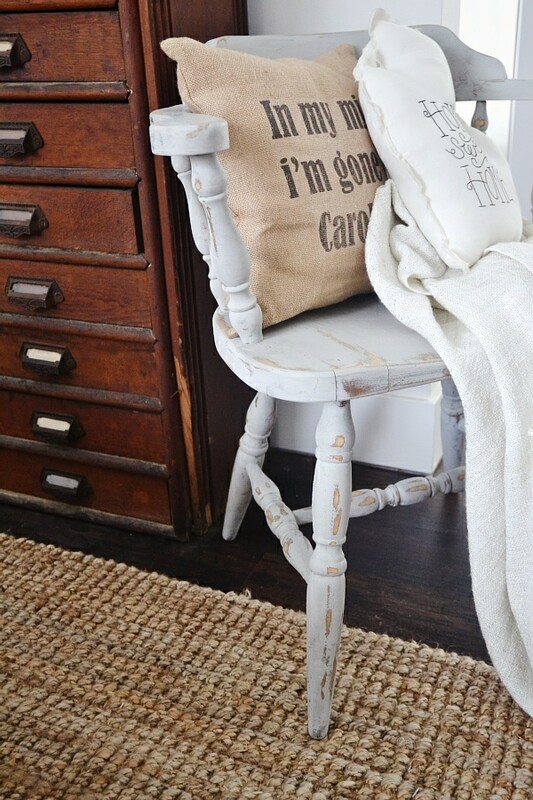 I have a chair I need to make over as well and I wanted to ask where you got the chalk paint at and the wax too! I’ve got the painting bug this winter and need to get to work! 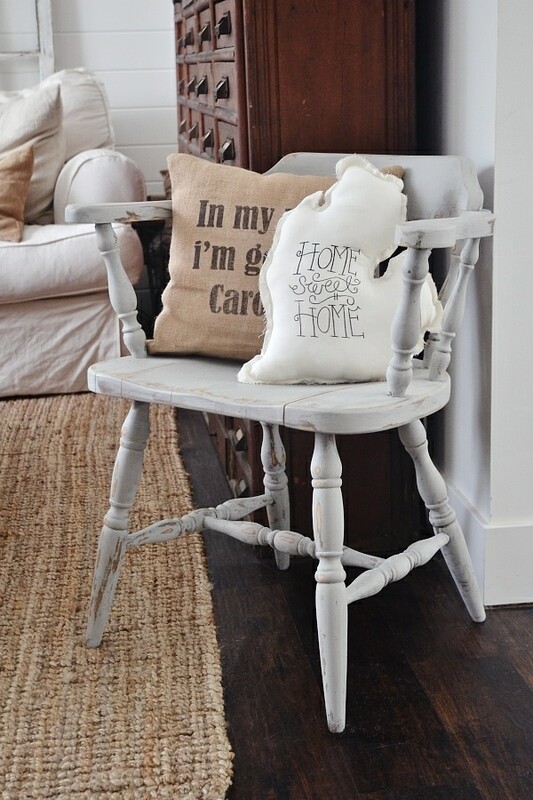 Love the chalk paint! It has the perfect rustic look! I recently saw a craigslist table and chairs that I now want to buy and do that to!!!! Can I ask where you purchased your white slipcovered sofa? Thoughts on it? Wonderful make over. I am loving that Michigan pillow too. Source for that?